UPDATED: Wed., Nov. 14, 2018, 10:13 p.m. Under threat of a lawsuit, the Idaho Fish and Game Commission voted unanimously Wednesday to temporarily suspend steelhead fishing on the Snake River, Salmon River and other waterways throughout the state. The fisheries will close on Dec. 7 and will not reopen for a spring season. The spring season was scheduled to open Jan. 1. The commission’s action was prompted by several conservation groups threatening to file a lawsuit against Idaho Fish and Game. The department’s National Oceanic and Atmospheric Administration-authorized take-license permit for steelhead expired in 2011. The lapsed permit allowed for the incidental harm of some wild steelhead during the course of legal hatchery fishing. .
NOAA has “chosen to address their resources to other high priority permitting issues,” Lance Hebdon, an anadromous fishery manager for IDFG, told the commission. The department applied to reauthorize the permit in 2010. Last week NOAA opened IDFG’s permit request to public comment, a necessary procedural step. However, the permit will not be reinstated in time for the normal spring fishing opener of Jan. 1. If the permit is reauthorized, the commission could reopen steelhead fishing at its March meeting. The spring season runs as late as May 31 in some areas. IDFG staff recommended that the commission vote to close the spring season instead of facing the threat of a lawsuit. Trever said the conservation groups did not consider how IDFG currently regulates steelhead fishing. And, despite a sit-down meeting last week, Tever said the groups filing the lawsuit indicated that they were not satisfied. Although Oregon’s permit has also lapsed, it has not been threatened with a lawsuit, she said. Washington has a valid permit. The groups filing the lawsuit include Idaho Rivers United, Friends of the Clearwater, The Conservation Angler, the Wild Fish Conservancy and the Snake River Waterkeeper. The groups filed a 60-day notice of intent to sue IDFG, IDFG commissioners and Idaho Gov. Butch Otter last month. Kevin Lewis, the executive director of Idaho Rivers United, said the lawsuit is about conservation. And he emphasized the larger picture: namely, that steelhead returns have dropped precipitously. “Idaho has been silent on salmon and steelhead for 10 years as our numbers have plummeted,” he said. Lewis pointed out that after years of not addressing the lapsed permit, NOAA reopened the process just weeks after the groups threatened to sue. Dustin Aherin, the owner of Idaho River Adventures and a former employee of Save Our Wild Salmon, accused IDFG of playing a political game. Aherin is not involved in the threatened lawsuit. Aherin emphasized the impact the closure would have on small Idaho communities that depend on money from the steelhead season. During the commission meeting Trever told the commissioners that if the litigation went forward, the department could be on the hook to pay the legal fees of the conservation groups. “The commission did not want to go to federal court, lose on a technicality because the federal agency dropped the ball on permit renewal, and have our anglers’ and hunters’ license dollars pay bills for advocacy-group lawyers instead of conservation,” he wrote. Tribal fisheries in Idaho will remain open. Additionally, Snake River boundary waters remain open to anglers licensed in Oregon and Washington, Moore wrote. 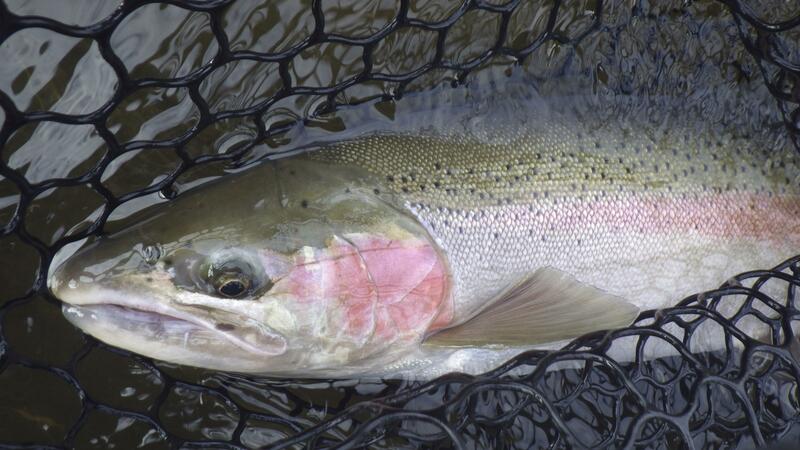 Wild Snake River steelhead are listed as a federally endangered species. This year’s returns are the worst in 40 years. Between July 1 and Nov. 6, 94,298 steelhead passed Bonneville Dam on the Columbia River. Last year at the same time, 113,486 steelhead had passed the dam. This is the lowest number of steelhead recorded at the dam since 1978. As of Nov. 6, 45,933 steelhead had passed Lower Granite Dam. At the same time last year, 66,022 fish had passed by Lower Granite Dam. Published: Nov. 14, 2018, 11:32 a.m. Updated: Nov. 14, 2018, 10:13 p.m.